Wiring up 2 batteries...what will this do? Topic: Wiring up 2 batteries...what will this do? I was thinking of wiring up a second battery for my boat where I could have one for starting and one for accessories...At the moment I only have a Blue Sea System 1, 2, 1/2, and off switch. 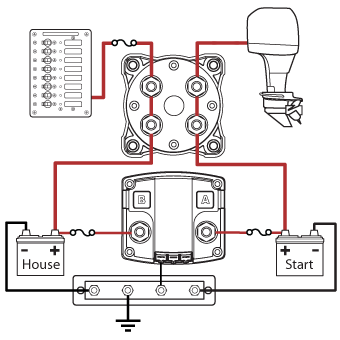 I believe this wiring scheme will work, but I think in the config, my accessory battery will also pull from the starter battery, correct? Is there a way to have it so I can charge both batteries from the engine but be able to use the acc battery without drawing from the starter battery? Otherwise, maybe I'll just have the acc battery totally separate and charge before each outing. Re: Wiring up 2 batteries...what will this do? Use a Blue Sea Add-A-Battery kit, with their automatic charging relay (ACR). It will isolate the Starting and House batteries when the engine(s) are off (or starting), but connect them to share the charging output of the motor when the engine is running. 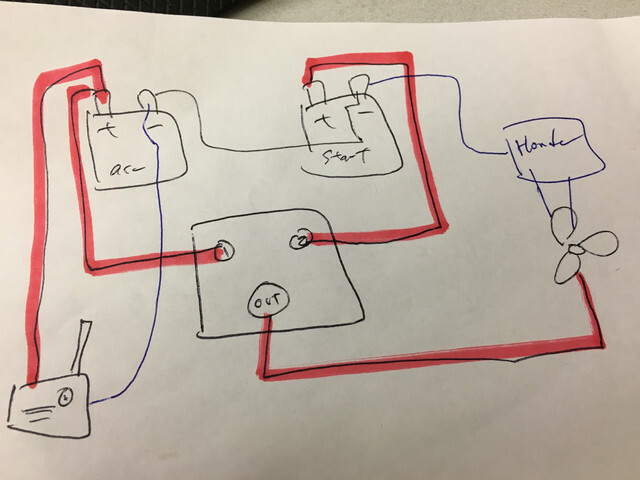 If that is a Blue Sea switch in your diagram, you would have an unswitched (no way to shut-off) connection to Battery #1, while the engine only charges one battery at a time. You want a switch of some kind as close the battery as possible on almost all of your loads, so that in case of a short of catastrophic wiring failure you can shut off power to as much of the wiring as possible and reduce the risk of a fire. Exceptions are a single VHF radio and a single bilge pump. Not a huge issue but the Blue Sea ACR will not provide start isolation unless you have a signal (12 VDC usually from your starting/ignition circuit) going to it. The issue there (probably more prevalent with higher HP engines with high starting current) is that, if the batteries are combined, you can have a system voltage drop that could damage electronics. This is mostly academic but definitely a possibility. I’m sure a couple of the resident electrical gurus can chime in regarding the risks of not hooking up the wire to start isolation. I checked with the good Honda mechanic here (I doubt WB would know) regarding where to tap off of the starting circuit for the isolation signal and he of course recommended not to tap into the harness on the controls side. I went the Blue Sea ACR route so let me know if you want to check it out in person. The ARC is only closed combining the batteries when a charging source is available. So when you are on the water when you start you will only draw from the start battery. The exception to that is if your trolling motor was running and charging the bats. Most dual battery switches allow you to combine the batteries if you need to. Now if that was because your start battery was dead the start battery should be isolated with another switch for the just the start battery or pulling the start battery fuse. That would keep the start battery from drawing down the house battery (acc). Thanks for clearing that up. I got confused with another old thread about house voltage problems and electronics failures. Looked up the techs specs on the Blue Sea site and the ACR won’t combine until it sees above 13 (or 13.6 depending on what page you look at) volts for 30 seconds. Its basically taking the human out of the equation as far as combining or isolating the batteries and in a lot of cases that’s a good thing. Thanks guys...Can someone with electrical knowledge explain why in my diagram both batteries don't drain together(unless I'm in 1+2) as the negatives are always connected regardless of which battery positive I connect to? Both batteries drain but one is recharged by the motor. The start battery drains when the motor is cranked over... but once running is topped up by the motor charging system. The ACC battery will only drain unless you switch it to the main engine to charge. This is why three weight is advising you to use a ACR is that both batteries are recharged while having the protection to keep you start battery isolated. The negative (B-) are common between both batteries, charging system (B-) and the block of your motor. The positive side is where the switching is done. I strongly do not recommend combining batteries this is only a “Hail Mary” option to get you started....if one of your batteries is shorted it can damage the other by combining (putting them in parallel). This is why the ACR is recommend as it will only combine when safe conditions in both batteries are present (safety combine both your batteries with one charge source). Yes you can charge either battery one at a time with the switch but I do not recommend combining...unless you have voltmeters on both batteries and know what you are doing. I would eliminate the switch in the Blue Seas diagram. That is what I have, the batteries are connected by the isolator, when the engine is on both batteries get charged, when the engine is off the batteries are separated (when the voltage between them drops below 13 volts or so). I do have a switch that will combine both batteries in the case of the starter battery not having enough juice to start the engine. Simple and automatic, I have never had a problem with this setup. I renew my Optima batteries every 5 years or so. This can be done with ACR also, please note that a isolator will have 0.6 to 0.7 volts dropped each Diode junction. They both work well but the ACR is more common on outboard installs. Isolators operate like one way check valves, they have no voltage sensing between batteries. A isolator is just two diodes back to back, to forward biased a PN junction it takes approximately 0.7 v (open the check valve). So for a alternator to charge a battey with a isolater the charge voltage has to be 0.7 v higher than the battery voltage. On outboard engines at low RPMs most times the voltage dose not exceed this threshold... so no charging could occur... VS a ACR has no voltage drop so it is able to charge at lower voltages. Forgive my questions, as they have been likely answered in this thread, but I still a little confused as to how the ACR works and which battery/switch combo I should use. I have been going over the blue seas diagrams as I diagram my re-wiring project. Most of the blue seas diagrams I have seen using an ACR use the 3-way battery switch (1/combine/off) with 4 terminals compared to the 4-way switch with 3. If I am not mistaken, this system charges both batteries as needed. I assume when it is switched to 1, the start battery allows draw to the motor and also activates the house battery for all other functions. The combine feature is only used in emergencies. I guess my question is how will an ACR work with the 4-way switch, or should I consider getting a 3-way instead? Does the ACR have to be also be connected to the ignition wire to work properly? On side note, what else should be straight wired to the house battery other than the bilge...VHF? Hope my questions make sense, it is probably something simple that I am just not getting. correct only the battery selected to the engine is being charged. The 4way has four positions off, battery 1, battery 2, and combine. You can use the 4 position but your are limited to having your house and start on the common pole, or you can add a second switch off the ACC battery. The ACR is wired across both batteries, it dose not care if you are on battery 1 or 2, it will combine when it sees a charge voltage at either battery. Glad I was not totally barking up the wrong tree. It seems that when I do my re-wiring, I should go with the 3-way battery switch in order to utilize the ACR and Start battery as intended. On the switch in the diagram I posted, there is no "1" setting... it is "on, off, combined". On works as you described... starting battery connected to motor, house battery connected to accessory loads, but both circuits isolated from each other. The ACR functions as the "bridge" between the two circuits to share charging current from the motor(s), but only connects them when it detects the proper conditions, then cuts out when conditions are not met. On a smaller Arima, I think the Blue Sea Add-A-Battery "mini" is all you need (for motors putting out 65 amps or less from their alternator). Bigger applications, or if you want overkill, the full size Add-A-Battery is rated for up to 120 amps. I used the full size on my old Arima 17 with my 90 Suzi, and now on my tin can with the big Honda 225. If the mini had been available, I'd have used it on the Arima as it is a little more space efficient. The kit + cables + the battery. Would both batteries have to be of the same type and CCA rating? Can I add one “new” battery and still use my current battery with that mini blue sea ACR kit? I was was under the assumption that it’s not a good idea to mix new and used :shrug9: Or does it not matter with that ACR mini kit? Good call 3WT. I will only need the mini. My motor puts out less than 40 amps. It will save me $ and space! I recommend that they should be... but I have seen many installs with non matching batteries. We mainly install the mini on smaller outboards, all large outboards and inboards get the larger ACR. Please follow the instructions for fusing and wiring. My Suzi's charging output was 27 amps. The big Honda is rated at 90 amps. With the blue sea/ACR kit can you still hook up a dual battery maintainer directly to the batteries while stored? Yes I have a Marinco dual output charger hooked up to mine, you can even have a single bank also as the ACR will combine and charge both batteries. So if using a single bank charger/maintainer would you only need to hook it up directly to one battery and it will charge both? And the ACR will distribute charge to the battery that needs it? The ACR only combines the batteries and will charge both , however it dose not manage the charge to battery needs. Or you can buy the new all in one ACR and dual bank charger. Is it better to leave the battery/batteries on the charger/maintainer at all times while stored or just charge every week or 2? With one of the modern charger/maintainers, you can leave them plugged in all the time. Personally, I prefer to wire my ACR off the "output" side of the Blue Sea switch, so it is only able to bridge the batteries when the switch is "on", and then run my 2 bank Marinco charger off the battery posts (well actually, the Blue Sea battery terminal fuse blocks). The Marinco charger is a "smart" charger, which can vary it's charging output to each battery individually. Perhaps a non-issue, but I worry about having an ACR connecting the two batteries and interfering with the function of the charger. Would be interested in hearing DevMah's thoughts on this. My boat is wired similar as one side of the ACR is wired to the switch ( batt 1 is wired directly to the ACR VIA MRBF fuses- The other side of the ACR is wired to pole #2 of the switch VIA MRBF fuses.) With the switch off the loop for the ACR is broken. I also have the same Marinco two bank smart charger, and yes it on all the time when the boat is moored or stored. This is the best method as each battery is charged individually and regulated ....no overcharging can occur. Now saying that I have never heard of a issue going to a single bank smart charger or trickle. Would this be a good way to do mine on my little 16 SC? This is the add-a-battery mini. Then when stored hook up my single bank Noco battery maintainer to one of the batteries? Which one would I hook the charger directly to? Starting or house battery? I’m thinking of doing it exactly like this diagram. Thoughts/comments? House battery or main... either the ACR will combine at either battery. Would this work with a bilge pump. My bilge pump does not automatically turn on. How does a bilge pump get wired with two batteries? The other issue is, after trolling a half of day using my TR-1 and kicker motor tends to drain the battery. I figured it is because the TR-1, fish finder, VHF radio, FM radio and maybe a cell phone is the reason. The kicker motor does not have an alternator. Yes it sounds like you have high draw but no way to recharge while running. Please note the bilge pump must have a float switch if leaving un-attended. Yes, to a deep cycle if possible. Because current doesn't flow through the negative side of the circuit. Usually B- is connected to ground (unless you have a floating voltage system) as it is considered zero volts. For this reason the B+ or AC hot has the switch is connected (the potential difference ). You want to be able to remove the potential difference from the load (remove power from the system). If you switched on the negative side you could have a arc to ground or not be able to shut the load off (isolate)as most systems are negative grounded. I use this term (potential difference) as we use +/- dc voltages to switch in PLC system and ACV, as is dose not mean a positive voltage just a difference from zero. Any voltage being positive or negative ( - or + potential difference) and not zero will cause current flow. If my above explaination is confusing the simple answer is you want to switch the hot side off not the zero side. B- and ground/neutral equal zero volts. So to answer your question both B- poles equals zero voltage and no potential difference.